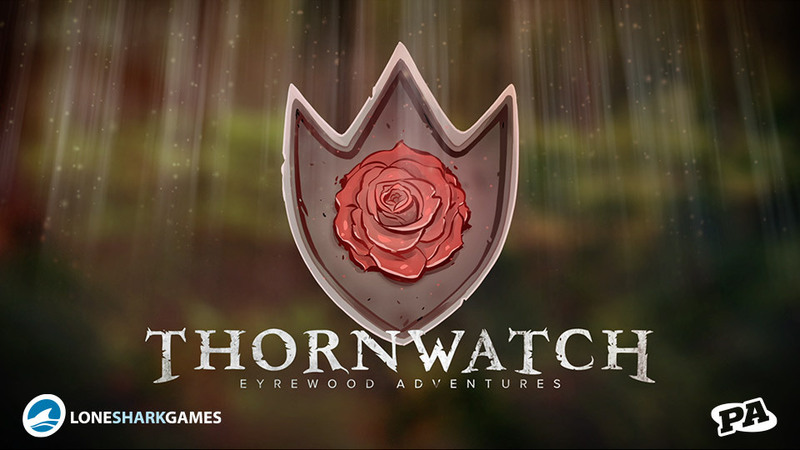 We made a surprise announcement on the mainstage at PAX West: We launched the Thornwatch Kickstarter! This is the third part of Lone Shark’s plan to publish our own games, starting with the Apocrypha Adventure Card Game (currently in layout and production) and The Ninth World: A Skillbuilding Game for Numenera (design done, working on art and development). On Thornwatch, we seem to have started off great. Here are some details. Thornwatch is the first game in the Eyrewood Adventures line that we’re making with our upstairs neighbor, Penny Arcade. Our design team, including the triumvirate of Mike Selinker, Chad Brown, and Lords of Waterdeep co-designer Rodney Thompson, joined with PA’s Mike Krahulik and Jerry Holkins to design this epic graphic novel adventure. You will feel like you are right in the middle of a comic book in this game. We released a print and play, which you can find on our new website. In it, one player is the Judge, who marshals the elements of the forest to achieve objectives and gain tokens of magical corruption called the Ebb. 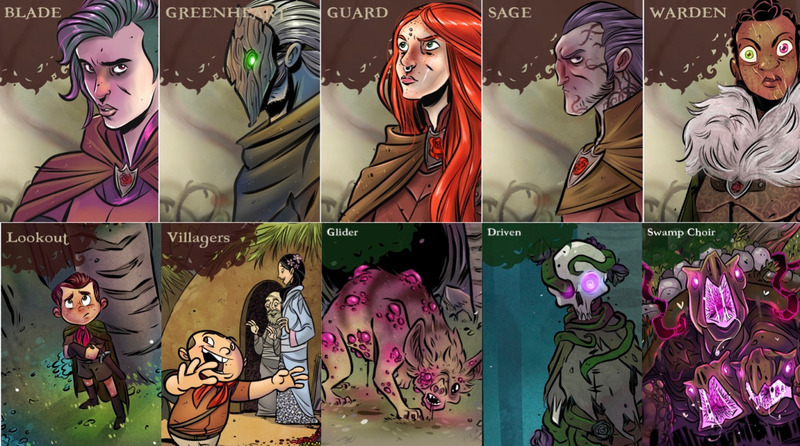 Each other player is a member of the Thornwatch, a magical band of forest guardians. A villager can summon them to an adventure by tying a bramble knot in a tree. Each character, denizen, and enemy has a momentum card, which you can see above. Those are used on the momentum track, a unique system for tracking initiative, damage, and progress. Each character also has a deck of cards. Below you can see our playtest version of a character’s hand, which has action cards unique to each character (here, the Sage’s Fireball and Bridge of Ages), skill cards (Mind and Spirit) which power them, and a wound card, which clogs up your deck. 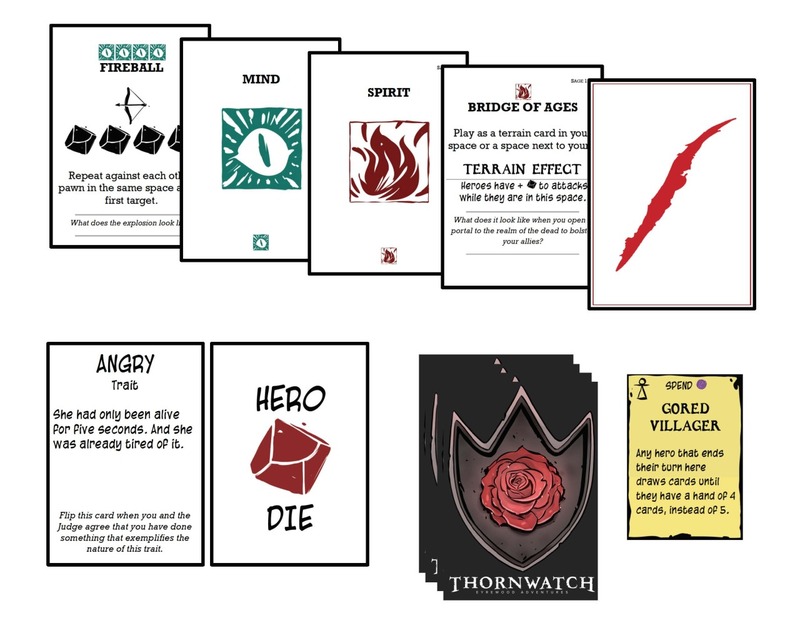 You can also see the character’s trait cards (Here, Angry’s front and back), which encourage acting in character to gain bonus hero dice, which are among the custom 10-sided dice in the game. The game also comes with terrain cards (here, Gored Villager) for the Judge, who arrays them on some modular map tiles. Below, you can see some of the village tiles, which combine to make a gorgeous picture, here shown in sketch form. These maps are assembled by the Judge using several storyboards. 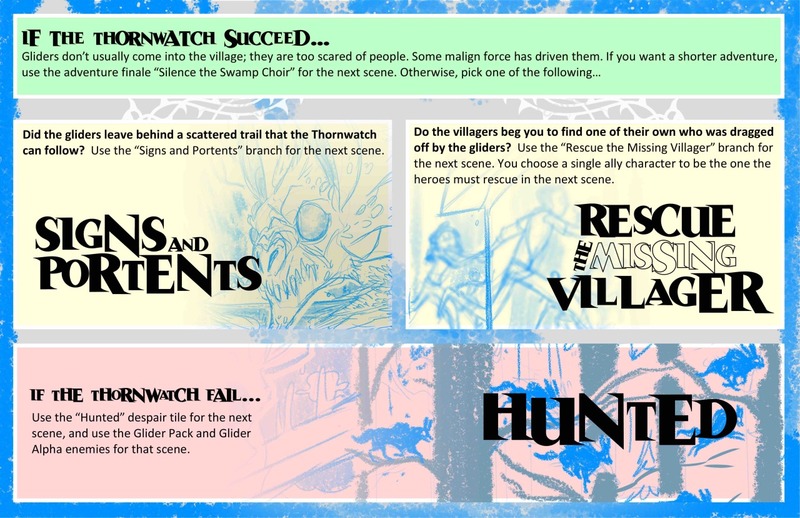 These have a mix-and-match flavor, each storyboard giving you the rules and story for a scene in the magical Eyrewood. Here’s a storyboard front by Mike K.
When you finish a particular storyboard, the Judge and players decide which direction to head: perhaps to the conclusion tile or a dead end, or maybe one of several branches. At the end of a successful adventure, the players—not the characters—are awarded the knowledge of a particular knot (here, the Knot of Wings), which each player can tie on their person to gain bonuses in play. That’s right, you can wear your game. 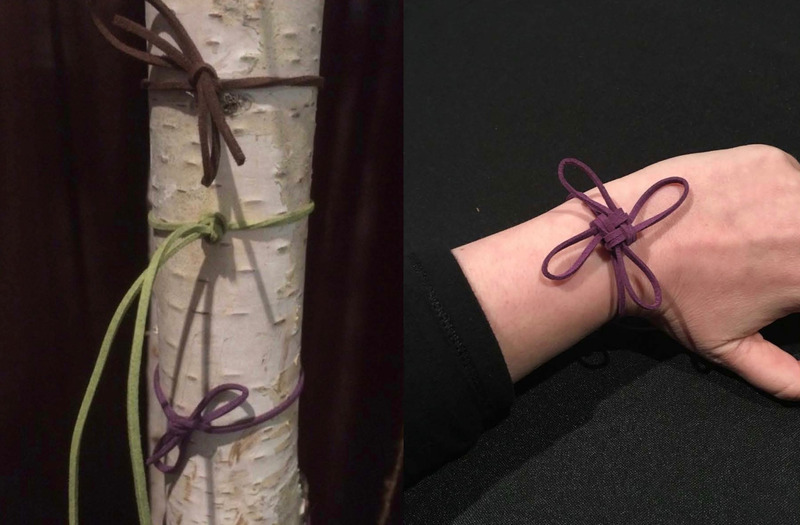 At PAX West, players who joined the Thornwatch could tie a knot in our birch trees (left) and gain the Knot of Wings (right). This knot let players who achieved it to start with a hero die already available on subsequent plays. 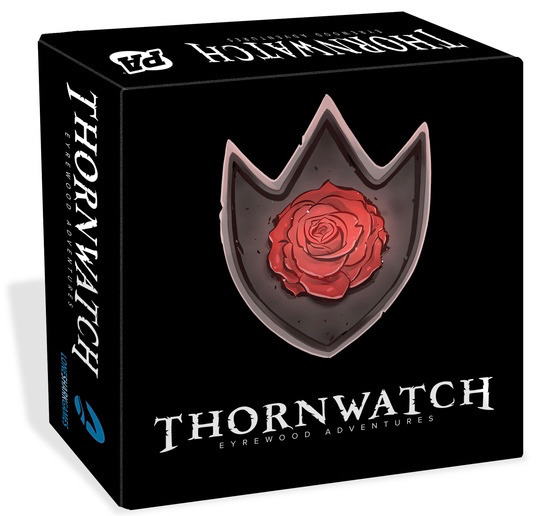 There’s a lot more to Thornwatch, and you can learn about it on the campaign page. We hope you like it!